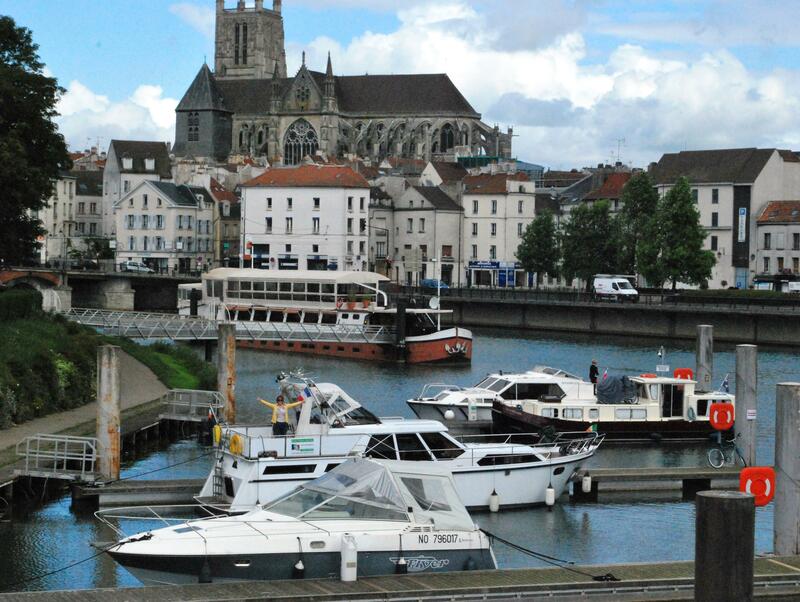 We spent from last Thursday up until yesterday in Meaux (Pronounced Mo) which is on the river Marne and is famous for its Brie cheese and Pommery Moutarde du Meaux (mustard). Neither of us wanted to leave and we had to finally force ourselves to leave yesterday. It was a total contrast to Paris- large local town with everything nearby and no rushing around or Metro underground. Even the torrential rain and thunder and lightning a few of the days did not put us off. The mooring pontoons were in the middle of the town and were almost free (you are supposed to only stay 48 hours and pay €4.50 per day for water and electricity). Someone from the tourist office only came twice to collect the money and would not take for more than one day at a time so we paid a total of €9 for five days and nobody told us to leave- this is France at its best! 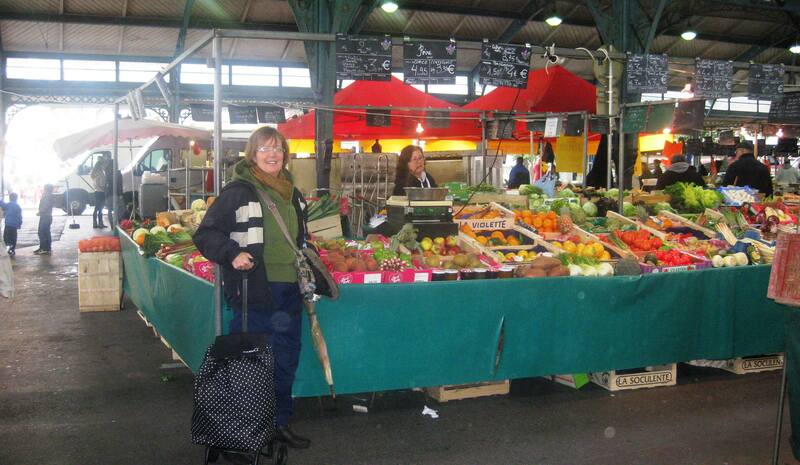 We went to a great market on the Saturday and bought loads of fruit, vegetables and some of the local Brie cheese. The Brie that was two years old had an amazing salty taste. Meaux had a good chandlery shop and I got lots of bits and pieces. This allowed me to get the battery monitor working after eight weeks (for the non-boaters very important as it tells us know the exact state of the batteries and when they will die if not on shore power). i.e . when the lights will go out! A little community of boaters rapidly formed and we had drinks and snacks on our deck the first night we arrived for anyone who was there. 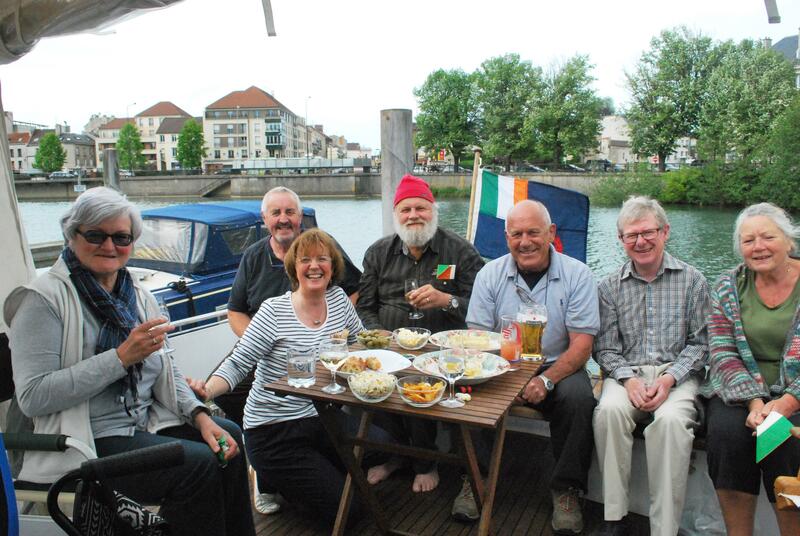 Ann & Bret on big barge Kismet (who we had meet last year), Terry and Terry (on Renaissance, a narrow boat from UK), Eric and Damiene (Jura in France on Amulet steel Belgium cruiser). That helped us renew old acquaintances and make new friends. Needless to say we got loads of advice and help over the next five days as the long-time boaters helped us “newbies”. Nuala is using a Gatao wine bottle that we got from Terry x 2, as a water carafe. So we are starting to recycle which is good. Six of us went to the local Chinese (Nuala said not to tell anyone we were in France and eating in the Chinese) but it was great value. All you can eat place for cost of €10.80 per person and the quality was really good. The two Terry’s recommended it and they were right! So we got real comfy in Meaux. But we have to shake ourselves and get moving again. What helped us was the others had left before us! Strasbourg is our next target and after that Berlin. At one level you could get used to this leisurely lifestyle with no deadlines. While both of us are enjoying it, we have decided we have things we want to achieve in life and we will go back next year to take up the challenge of life again! This entry was posted in On the Journey, People We have Meet on the Gap Year, People who have helped us on our way, Places visited and tagged Amulet, Brie Cheese, Kismet, Meaux Pontoons, Pommery Moutarde du Meaux, Renaissance. Bookmark the permalink. That sounds like a place u could live for a few months! We could have- but we had to get moving. On doubt there will be lots of other places just as good! welcome to la ferté sous jouarre! anyway greeting from la Ferté sous Jouarre and Minane Bridge county Cork! France is my favourite place on the planet and i am reading with envy LOL – really enjoy reading the blogs. Glad you are having a great time well done to Nuala for embracing ‘camping on water’ I would have been checking into a hotel for the day for a hot bath by now!